Leading indicators precede aggregate economic activity and signal policy makers about the state of the economy. 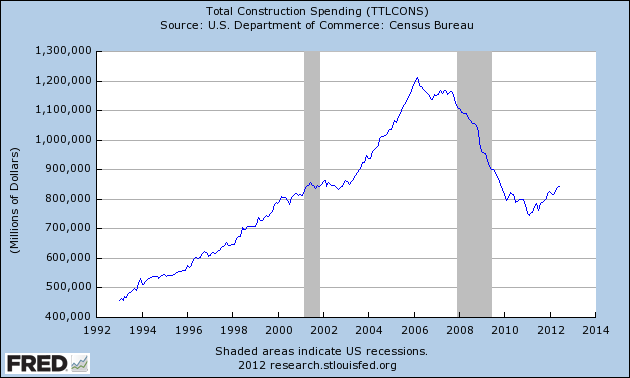 Construction spending is usually considered a reliable leading indicator, and the figure below shows that total construction spending fell considerably before the beginning of the Great Recession (the shaded area). And yes the indicator shows that a very slow recovery is now under way. We are around the levels of spending of 2003. Note that the fall in construction spending in the previous (and milder) recession was almost imperceptible (we were in the beginning of the housing bubble after all). Also, this is one of the problems with the collapse of housing bubbles, not only deleveraging implies that consumers are less capable of spending, but also the overinvestment in housing during the boom implies that a key sector, construction, has a very slow recovery. Further, today the jobs' numbers were released with 163,000 nonfarm payroll jobs created, up from 64,000 last month. It is hard to see this as a prove of strenght in the labor market, as the Conference Board suggests. We needed to be creating something more like 400,000 for a healthy recovery. Unemployment ticked up to 8.3%.